It's Back and Everyone Wins! Everyone is a winner! It's our way of saying thanks for being a loyal customer and celebration of our 6 years of being in business! Don't forget we have gift cards! Everyone is a winner! It's our way of saying thanks for being a loyal customer and celebration of our 5 years of being in business! Don't forget we have gift cards! We at Vero Pizza wanted to do something exciting and fun for the spring. So we are happy to announce our photo contest. We are asking our patrons to submit the best photo of their Vero experience. Entries may be submitted either via Instagram or posted to our Facebook page. Submissions will be accepted from today until midnight (EDT) June 1st. The public will be encouraged to like their favorite submissions right from the start and will decide our winner based on the staff favorites starting the first week of June. 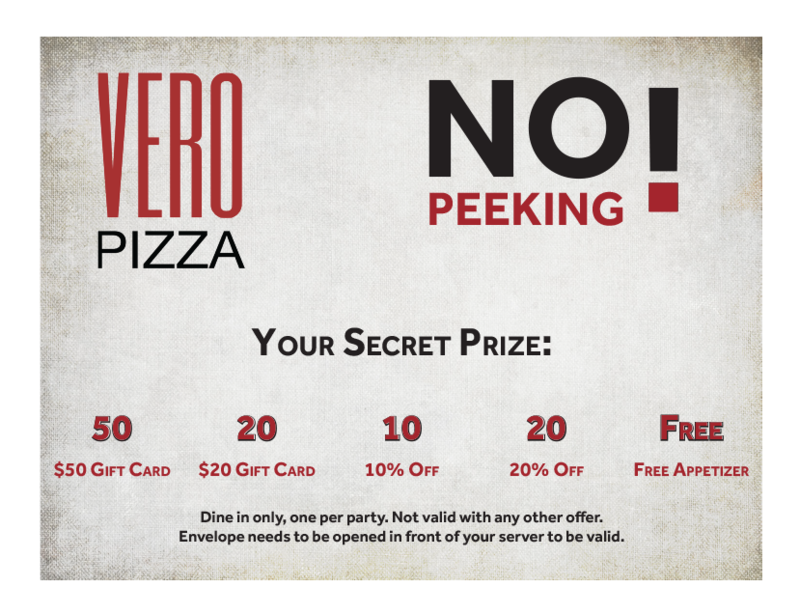 The patron with the winning submission will receive a $25 gift card for a future visit and the runner up will receive a Vero Pizza T-shirt. To be eligible for the contest patrons must be either following @veropizzact on Instagram or have liked our Facebook page. Submissions must also include #veropizza and tag @veropizzact (Instagram) or be posted directly to our Facebook page. Starting June 2 the Vero staff will pick their favorites which will be reposted on our Instagram and our Facebook page and then the public will be invited to vote for their favorite. The submission with the most likes will be determined as the winner and the submission with a second most the runner up. Prizes should be awarded by June 15 at the latest. Vero Pizza reserves the right to make any changes to the prizes or contest rules without notice. By submitting your photo you grant Vero Pizza the right to use the photo in future promotions, etc. and without written consent. All submissions must be original photographs. Must be 14 years of age or older to enter the contest. If a minor child's entry is determined to be the winner the prize must be claimed by a parent or legal guardian.